When it comes to change; many will flood into the streets with signs seeking it, wear T-shirts proclaiming the need for it, some will put bumper stickers on their cars to declare it, but few want to apply change to themselves. For far too many folks, they see something they think is way over-the-top and want to respond in kind with a change strategy known as "knee-jerk" and will run as far and as fast as they can in the opposite direction of the perceived offense to make it so [ha]. Such is the case of many of my fellow vino-sapiens in the "No-Oak" movement and you know who you are. Folks, who from my observations have this same "knee-jerk" response to wines where some barrel regiments have become known for producing a Chateau Two-by-Four style of Chardonnay, aka the "classic" California Chardonnay. While I'm no fan of that style, I think those wines are simply out of balance. But, rather than over react to it, I like to let the market place sort out issues like this and in most cases it does, it has and will continue to do so. But what are we really talking about, it's differences of style and like anything else in life, everyone has their own style. When it comes to wine; again every vino-sapien has their own style, which is great, because as we all know variety can be the spice of life. But do we really need to run around carry placards, decrying the use of oak? Of course not that is just silly. When it comes to wine, I say drink what you like, even if your only desire is to drink what I consider to be plonk. To me, as long as you're drinking wine, I'm very happy to see that and bid you a hardy welcome. And by the way, thank you at the same time, because that means there's less competition in acquiring the wines I want to drink. Oh, I may scoff a wee-bit to myself, seeing you happily slurping down a few bottles of two-buck chuck or other plonkish types or styles of wine. But we all start somewhere on our wine journey and if some folks are content to stay where they are, so be it. I won't publically condemn you, point and laugh, nor will I deride your choices. You also won't see me will start a movement; pontificating a message from my ivory wine tower [which is actually crimson] saying, "you should drink this and not that" or will you hear me nag producers to make a certain style of wine. And finally will you ever hear me say one should only drink this "juice" because it was produced locally. I say "think globally and drink globally". Now that said, I've never been a fan of the "No-Oak" style of Chardonnay and typically I won't even be interested in giving it a cursory swirl, because I had of enough of these wines to know, it's just not my style. But when a wine is sent as a sample for the review process, I feel it's my duty, no I say my obligation to at the very least give it a swirl, just once. So it's in the case of the SIP Certified Tolosa "No-Oak" Chardonnay from San Luis Obispo, another Central Coast selection. I was really surprised by the opulent mouth feel of this wine, I was caught off guard by its richness, its minerality and its honeyed rich core of bright vivid fruit [apples, pears] hanging nicely upon mouth watering acidity, inviting a just a sip at first and than a full gulp. Wow, this wine is nicely done, I complimented them openly on twitter already and I am very proud to recommend this wine to each and every one of my readers, this folks is how you make a wine of this style. 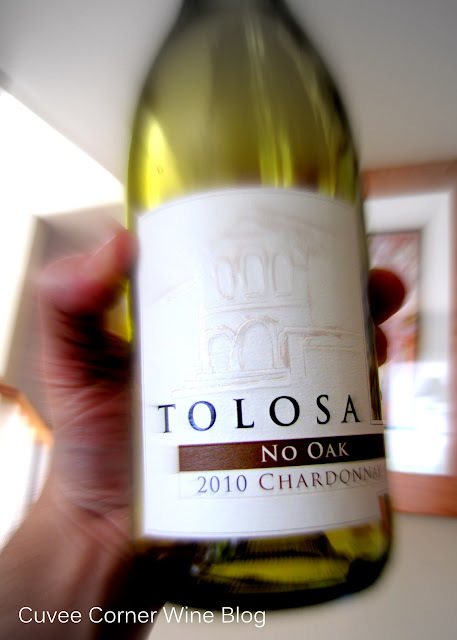 I believe, if more wineries were following Tolosa's lead, in regards to producing "no-oak" styles of Chardonnay, I think this "style" would and could gain more of a following. "No-Oak" Chardonnay does not have to be like the "prius" of the automotive world. I say that because as the winemaker [Larry Brooks] for Tolosa points out "In a wine as transparent stylistically as this is; any and every flaw will stick out.”. It's precisely those flaws, which I see in many "no-oak" styles today; making drinking those wines more like the reason most folks drive a "Prius" in the first place, they want to be seen, whether it's a good fit for them or not. This wine is 100% Chardonnay and 100% No Oak. The grapes used to produce this wine broke down this way; 50% Tolosa Estate and 50% Santa Lucia Highlands, hanging on vines derived from a mix of Dijon and Heritage clones. Here’s I believe the secret to this wines great success, they keep the wine on its fine yeast lees for up to 10 months. I believe this method is known as Sur lie, but I'm not a winemaker, nor do I play one on TV. This brilliant and wonderfully refreshing wine sells for just under $20 most places; I scored this wine 91 points. Until next time folks sip long and prosper cheers! I LOVE that we didn't even know this about you... And yet, you enjoyed this little gem :) We find that many REALLY love this wine when we're out there sharing it with others. We really love our friends at Tolosa - great people, great property, great wine. Cheers! Ahh, yes the true confessions of a wine blogger, now the world knows, I'm no fan of the No-Oak style, but Tolosa made me think there is some hope for this style of wine. Thank you for the review of the No Oak! Next time your in the area we welcome you to try our barrel fermented Chardonnay's produced from our cool climate estate. Thanks for the review Bill! We welcome you to try our barrel fermented Chardonnay's from our estate as well in the future! I had so much fun writing this post, your great wine really inspired me to not only untwist the cap, but to pop-off about a few of my other favorite hot-button issues. I look forward to seeing you guys soon and giving that barrel fermented Chard a swirl, the Mrs. and I get up that way pretty often.